Another of my favorite assemblages is entitled Lepidopterix. The inspiration behind this creation all started with the gorgeous green feather fringe my friend Susan brought back from VVRouleaux London. That fringe started a lot of things…. I actually reorganized the supplies in my cabinets (as in my blog banner above) just to display that single coil of impossibly beautiful, “I-could-never-even-think-of-cutting-this!” fringe. After much prodding from Susan, I agreed to design an assemblage using a piece of this green feathered treasure. What to do? Somerset Studio had recently issued a “Green” challenge, so that seemed like a good place to start. 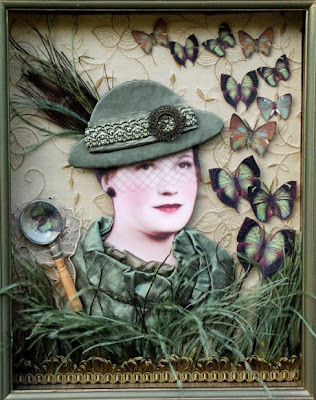 I was inspired by Lynne Perrella’s use of her vintage paper doll image in several beautiful assemblages, and started pouring over my photo stash for a suitable image. A picture of my grandmother was the stand-out of the crowd, but her simple black dress continued to be a design problem. In a fit of frustration at one point, I cut out her head and neck, leaving the scraps of her pretty portrait in shreds on the studio floor. Voila! Separated from her unimaginative attire, her face was suddenly a beautiful, striking component, laden with costume possibilities. What would she imagine herself to be? After digging through a box of some of her “small things”, I came across a lovely little magnifying glass. Still pondering her story, the coil of feather fringe standing upright on the table began to sway slightly as I moved about. Hmmmm…. feather fringe now looked like lush, mysterious grass. Given my grandmother’s passion for natural sciences, I knew she would approve of this new alter ego that was slowly taking shape – world traveler and butterfly collector extraordinaire – Lepidopterix. I was honored and thrilled beyond words to be included in Somerset Studio’s January/February 2008 issue – my first piece of artwork to ever be published. Construction info: The background of the assemblage was made from an embroidered silk remnant attached to a foam core board base. I assembled her portrait components in small units, sewing each unit to a base of heavy interfacing. Her clothing and hat are made of silk. Additional feathers and trims, along with an antique 1890’s beaded ornament and vintage horsehair veiling were sewn to the hat assembly. A spacer bar covered in silk was placed behind her head. Clip-art butterflies were colored and resized, mounted to cardstock, and mounted to the background using foam tape. Antennae were fashioned from peacock feathers for the larger, “close-up” butterflies. The magnifying glass was mounted to a sculpted, padded base which was covered with a tattered piece of antique lace. The feather fringe was sewn to the bottom of the assemblage, layered with an additional piece of upholstery trim. The frame of the shadowbox was painted green with a glaze coat of metallic bronze. Congrats on being published... another amazing work of art. You are fantastic at these... you have inspired me to try one some day soon!